Of the form of prayer which Christ has prescribed to us this may be called, as I have said, the Second Table. I have adopted this mode of dividing it for the sake of instruction. 437 “Je l’ay ainsi divisee par ci devant pour enseigner plus familierement.” The precepts which relate to the proper manner of worshipping God are contained in the First Table of the law, and those which relate to the duties of charity in the Second. Again, in this prayer, — “I have formerly divided it thus, in order to instruct more familiarly.” our Lord first instructs us to seek the glory of God, and then points out, in the second part, what we ought to ask for ourselves. But it must be observed, that the prayers which we offer for our salvation, or for our own advantage, ought to have this for their ultimate object: for we must not be so exclusively occupied with what is advantageous to ourselves, as to omit, in any instance, to give the first place to the glory of God. When we pray, therefore, we must never turn away our eyes from that object. There is this difference, however, between the two kinds of petitions which we have mentioned. When we pray for the kingdom of God and the sanctification of his name, our eyes ought to be directed upwards, so as to lose sight of ourselves, and to be fixed on God alone. We then come down to ourselves, and connect with those former petitions, which look to God alone, solicitude about our own salvation. Though the forgiveness of sins is to be preferred to food, 438 “Combien que la remission des pechez est bien a preferer a la nourriteurde cette vie.” — “though the forgiveness of sins is greatly to be preferred to the nourishment of this life.” as far as the soul is more valuable than the body, yet our Lord commenced with bread and the supports of an earthly life, that from such a beginning he might carry us higher. We do not ask that our daily bread may be given to us before we ask that we may be reconciled to God, as if the perishing food of the belly were to be considered more valuable than the eternal salvation of the soul: but we do so that we may ascend, as it were by steps, from earth to heaven. Since God condescends to nourish our bodies, there can be no doubt whatever, that he is far more careful of our spiritual life. This kind and gentle manner of treating us raises our confidence higher. Some are of opinion, that τὸν ἄζτον ἡμῶν ἐπιούσιον means our supersubstantial bread This is exceedingly absurd. The reason assigned by Erasmus is not only frivolous, but inconsistent with piety. He reckons it improbable that, when we come into the presence of God, Christ should enjoin us to make mention of food. As if this manner of instruction were not to be found in every part of Scripture, to lead us to the expectation of heavenly blessings, by giving us a taste of temporal blessings. It is indeed the true proof of our faith, when we ask nothing but from God, and not only acknowledge him to be the only fountain of all blessings, but feel that his fatherly kindness extends to the smallest matters, so that he does not disdain to take care even of our flesh. That Christ speaks here of bodily food may easily be inferred: first, because otherwise the prayer would be defective and incomplete. We are enjoined, in many passages, to throw all our cares into the bosom of God, and he graciously promises, that “he will withhold from us no good thing,” (Psalm 84:11.) In a perfect rule of prayer, therefore, some direction must be laid down as to the innumerable wants of the present life. Besides, the word σήμερον, today, means that we are to ask from God no more than is necessary for the day: 439 “Sinon au pris que le jour vient l’un apres l’autre;” — “only as far as one day comes after another.” for there is no doubt, that he intended to restrain and guide our desire of earthly food, to which we are all immoderately addicted. Again, a very frequent Synecdoche occurs in the word bread, under which the Hebrews include every description of food. But here it has a still more extensive meaning: for we ask not only that the hand of God may supply us with food, but that we may receive all that is necessary for the present life. The meaning is now obvious. We are first commanded to pray, that God would protect and cherish the life which he has given to us in the world, and, as we need many supports, that he would supply us with every thing that he knows to be needful. Now, as the kindness of God flows in uninterrupted succession to feed us, the bread which he bestows is called ἐπιούσιος, that is, continual: 440 "Superveniens;” — “survenant, ou venant par chacun jour;”— “succeeding, or coming by each day.” We subjoin an extract from the Dissertations of Witsius on the Lord‘s Prayer. After mentioning several views of Commentators on this petition, he says: This great variety of expositions has been principally occasioned by the Greek word ἐπιούσιος. That word occurs nowhere else in Scripture, and the most learned men have been unable to discover it in any profane writings. As it is not known to what Hebrew word employed by our Lord it corresponds, it is not surprising that different persons should have assigned to it different acceptations. — I shall not now enter into a critical examination of the very numerous expositions of that word which have been given by learned men. An exposition more copious and learned than any that had previously appeared, has been given by a very celebrated and learned man, JOHN MARCK, formerly my much esteemed colleague in the University of Friesland. It forms a part of his Juvenile Dissertations, as he is pleased to style them, but which contain much profound wisdom. The simplest and most probable of the various etymologies, I have always thought, is that which supposes ἐπιόσιος to be compounded of ἐπὶ and οὐσία, as περιούσιος is compounded of περὶ and οὐσία The analogy of composition of such words presents no difficulty: for it does not require that the ι in the word ἐπὶ shall be dropped before a vowel. This is proved by the words ἐπιεικὴς, ἐπιόγδοος, ἐπιόρκος, ἐπιόπτομαι, ἐπιοῦρος, and many of the same form. This derivation being granted, which has nothing unusual or anomalous, considerable progress has been made in the investigation of the subject. For as τὸ περιούσιον signifies what is more than enough, and beyond what the preservation of existence requires, so τὸ ἐπιούσιον signifies what is enough. Such is the meaning assigned to it by the ancient Greek writers, who were deeply skilled in their own language. “ ́̓Αρτου ἐπιούσιον, (says Chrysostom, Hom. 30, Ton. 5.) τουτέστιν ἐπὶ τὴν οὐσίαν τοῦ σώματος διαζαίνοντα, καὶ συγκρατὢσαι ταύτην δυνάμενον, — “that is, what passes to the substance of the body, and is able to support it.” Ζητεῖν προσετάχθημεν , (says Gregory Nyssen,) τὸ πρὸν τὴν συντήρησιν ἐξαρκοῦν τὢν σωματικὢν οὐσίαν “We have been commanded to seek what is sufficient for the support of the bodily existence.” Basil explains it to be τὸν πρὸς τὴν ἐφήμερον ζωὴν τὢ οὐσία ἡμῶν χρησιμεύοντα, “what is useful to our existence for daily life.” (After referring to Suiceri Thesaurus, and quoting from Cyril of Alexandria and from Theodoret, he concludes ἄρτον ἐπιούσιον to be equivalent to the phrase used by the Apostle James, (2: 15,) τὴν ἐφήμερον τροφὴν, (daily food )—Biblica1 Cabinet, vol. 24, pp. 266, 272-274. — Ed. But here an objection may be urged. 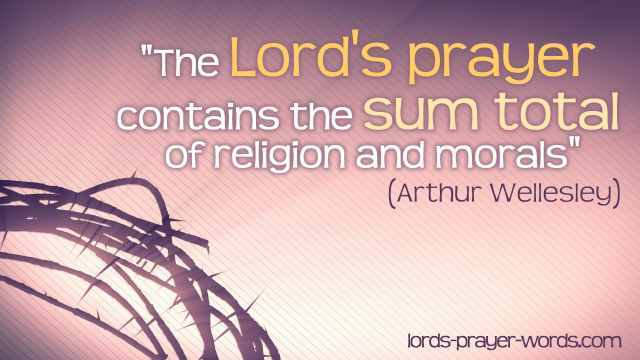 It is certain, that Christ has given a rule for prayer, which belongs equally to all the godly. Now, some of their number are rich men, who have their yearly produce laid up in store. Why does he command them to ask what they have at home, and to ask every day those things of which they have an abundant supply for a year? The reply is easy. These words remind us that, unless God feed us daily, the largest accumulation of the necessaries of life will be of no avail. Though we may have abundance of corn, and wine, and every thing else, unless they are watered by the secret blessing of God, they will suddenly vanish, or we will be deprived of the use of them, or they will lose their natural power to support us, so that we shall famish in the midst of plenty. There is therefore no reason to wonder, if Christ invites the rich and poor indiscriminately to apply to their Heavenly Father for the supply of their wants. No man will sincerely offer such a prayer as this, unless he has learned, by the example of the Apostle Paul, “to be full and to be hungry, to abound and to suffer need,” (Philippians 4:12,) to endure patiently his poverty or his humble condition, and not to be intoxicated by a false confidence in his abundance. Does any one inquire, why we ask that bread to be given to us, which we call OUR bread? I answer: It is so called, not because it belongs to us by right, but because the fatherly kindness of God has set it apart for our use. It becomes ours, because our Heavenly Father freely bestows it on us for the supply of our necessities. The fields must, no doubt, be cultivated, labor must be bestowed on gathering the fruits of the earth, and every man must submit to the toil of his calling, in order to procure food. But all this does not hinder us from being fed by the undeserved kindness of God, without which men might waste their strength to no purpose. We are thus taught, that what we seem to have acquired by our own industry is his gift. We may likewise infer from this word, that, if we wish God to feed us, we must not take what belongs to others: for all who have been taught of God, (John 6:45,) whenever they employ this form of prayer, make a declaration that they desire nothing but what is their own.